Feeling good about what you wear often comes down to being able to pick out one thing that you feel personally connected to. I have a favourite pair of earrings that seem to go with everything. 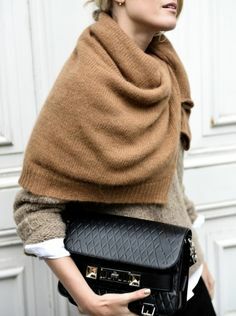 Some of us love this time of year, when we can finally pull out our soft warm oversize scarves. Or when we find the perfect tailored leather jacket. The next time you open your closet and think "I have nothing to wear", try to see beyond the mis-matched items, and pull out something that has given you pleasure and confidence to wear. Keep it simple, and you'll likely feel as good as you look.